In 1995, Buhler Quality Yarns was established in Jefferson, Georgia, as a yarn manufacturer and a supplier to the sheeting industry hubs in Alabama and North Carolina. In reaction to changes in the market and customer demand, Buhler started making knitting yarns with long and extra-long staple cotton, designed for apparel. The company became a licensed “Supima” cotton processor and also began experimenting with innovative new fiber blends. As the demand for products made with the softer long-staple cotton and fiber blends grew, Buhler slowly increased their production utilizing equipment and processes that were designed for their original yarns. Although their approach was working, they knew that they were not producing at full-capacity, due to an issue with the bobbins. 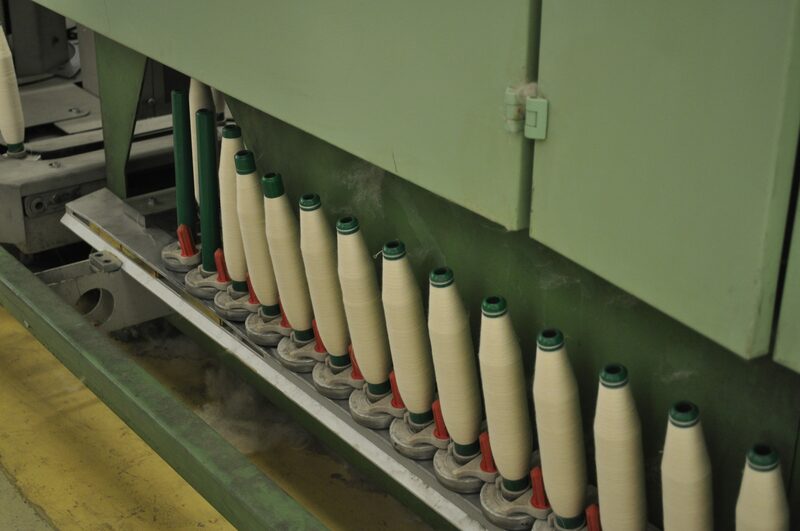 These bobbins, spools that hold the yarn during spinning, were falling over and causing the machines to stop until an employee was able to rectify the situation and re-start the machine. Russell Mims, vice president of operations, was aware of this issue and had been trying to think of solutions when he happened to meet Bill Nusbaum, Northeast Georgia Region Manager for the Georgia Manufacturing Extension Partnership (GaMEP), at a GaMEP Manufacturing Growth Meeting in Jefferson. Nusbaum visited the plant and after better understanding the problem, recommended that the GaMEP facilitate a problem solving event at the facility, involving a team of employees from various departments across the organization. Mims asked three employees from different departments to participate in the event in addition to himself, Nusbaum, and GaMEP project manager Damon Nix. After learning a 4-step problem solving method, the team applied each step to observe, brainstorm ideas, prioritize ideas based on a number of different factors, and then create a plan of action. After the event, the team was instructed to systematically try each suggested solution found and report back on their progress. Within a few weeks, the problem was found to be a system of blowers that rotated around the machinery, removing dust and lint during the spinning process. The blowers were blowing too hard for the weight of the new yarns causing the yarn ends to blow around, get stuck together, and pull the bobbins over. With a simple adjustment, they were able to solve the problem and create substantial increases in production. Bobbins that are similar to those studied during the problem solving project. 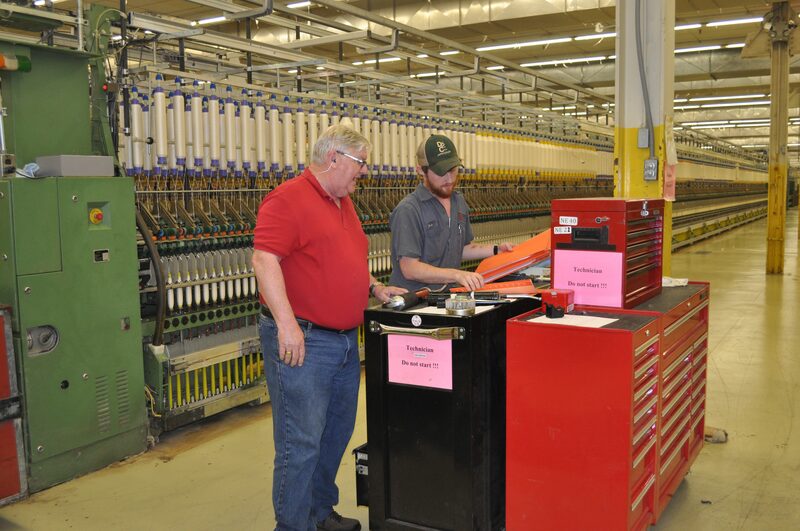 Russell Mims and Jake Marlowe working together at Buhler Quality Yarns. Download the Buhler Yarns Success Story Flyer.